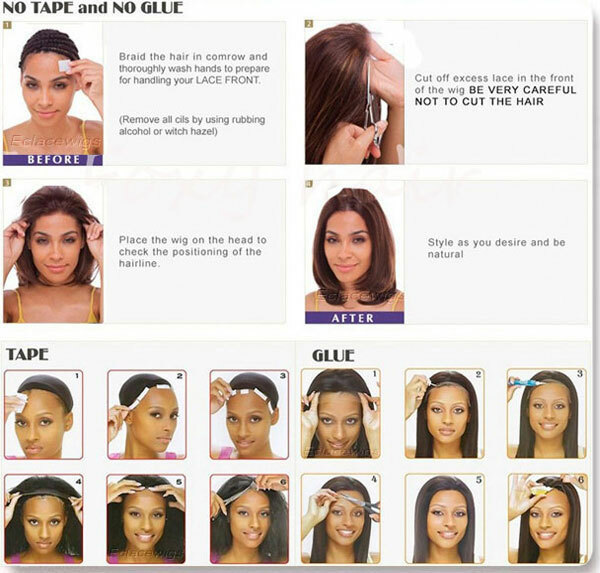 How to Apply Human or Synthetic Hair Full Lace Wigs Using Glue or Adhesive? Things needed:Wig glue,Small brush,Scalp protector,Scissors,Hair dryer. 1.Make sure that the skin below your hairline is hairless, clean and free of styling products and oils. This is where you will attach your full lace wig, and prepping the area can ensure hold firmly. 2.Cut the lace of the wig back to the hairline, being careful not to cut any hair off the full lace wig. To see where you need to cut, position the full lace wig on your head in front of your hairline. If you match the wig up with your hairline, then your hair will get glue. 3.Clean and dry your face and neck to prep the area for application of a scalp protector! 4.Apply a scalp protector below your hairline and let it dry completely. This is optional, but will provide maximum adhesion for your full lace wig, as well as protect your scalp and the perimeter of your head from the glue. You can buy scalp protector at any beauty supply shop or online store, or find it from the same retailer where you bought your full lace wig. 5.Use a small eyeshadow brush or the brush included with the glue to apply it below the hairline, where the front of the wig will be! 6.Dry the glue for at least 30 to 45 seconds with a blow dryer that's on a cool setting. The purpose of this is to make the glue tacky, which will provide better adhesion. Depending upon which brand of glue you use, this can take 15 minutes or more. 7.Press the front hairline of the full lace wig to your skin where the glue has been applied, and press down firmly until the wig stays in place on its own--this can take up to one full minute. Repeat this process for the nape and sides of the full lace wig as well. 8.Wait at least 15 minutes for the glue(adhesive) to dry before trying to style your full lace wig. If you try to style it too soon, the full lace wig will be moved out of place.